The winds and rains have passed, but the storm is not over. As more than 60 tornadoes ripped through the southeastern states, people lost homes, property and loved ones, with 21 lives claimed by tornadoes in Albany, Georgia, and Hattiesburg, Mississippi. 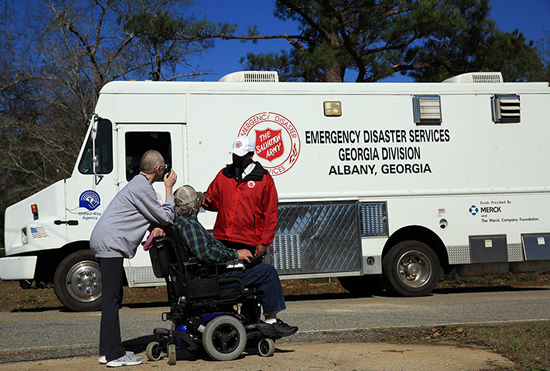 In addition to the much needed emotional and spiritual care provided by Salvation Army officers in the southern states, The Salvation Army has served more than 11,500 meals, 7,800 snacks and 13,800 drinks to survivors and first responders in the southeast region. That food was distributed from seven mobile feeding units (canteens) manned by more than a dozen volunteers. Volunteers at The Salvation Army in Hattiesburg were providing food, drinks and prayer to community members on Saturday as early as officials would allow, despite The Salvation Army corps buildings in Hattiesburg sustaining heavy damage, rendering many unusable for a projected nine months or more. The recovery effort was even aided last week by Phillip Phillips, American Idol winner and Albany, Georgia native. Major Kelley English was grateful for the help as The Salvation Army stayed hard at work through the week. Food service is coming to a close, but The Salvation Army will continue to serve as long as there is a need and resources allow. With the help of generous individuals, The Salvation Army will be able to strengthen thousands of families who were left in need following this tragedy.